Amazon’s Kindle Fire Tablet is available as Kindle Fire, Kindle Fire HD 8, Kindle Fire HD 10 and in Kindle Fire Kids Edition. Hence, this Kindle Fire Comparison to help you choose the best Kindle Fire to suit your own unique requirements and budget. As mentioned above, visitors landing on Amazon’s Kindle Fire Tablets Page are basically greeted with 4 different models of Kindle Fire, which are again available in “Special Offers” and “Without Special Offers” versions. 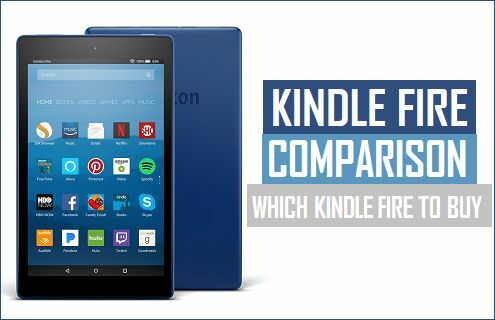 In case you are like most buyers, you will be looking to answer the following questions, before moving onto comparison of Specs & features of these four different versions of Kindle Fire Tablets. So, let us get started on this Kindle Fire Comparison by trying to answer the above questions. Later, on we can take a look at the specs and features of all these Kindle Fire models. Whether to Buy Kindle Fire With Special Offers or Without Special Offers? While Kindle Fire tablets are often available at deeply discounted rates on Amazon, you can save another $15 by going for Kindle Fire with Special Offers. If you buy Kindle With Special Offers, Amazon will serve you Ads on the Lock Screen of your device and it will also inform you about special deals and offers on Amazon. Mostly, the Ads from Amazon will be based on your Amazon browsing history and the Ads will only appear on the Lock Screen of your device. In case you do not like these Ads, you can always remove them by going to your Amazon Account and unsubscribing from Special offers. In return, Amazon will charge you for the difference between Kindle Fire with Offers and Without offers. To switch OFF Ads, go to “Manage Your Devices” page at Amazon’s website and de-register the Ads. You will be requested to pay the difference between Kindle Fire with Ads and Kindle Fire without Ads ($15). Now that you know the difference between “Kindle Fire with special offers” and “Kindle Fire without Offers”, it is time to take a look at different models of Kindle Fire as available at Amazon. As mentioned above, Kindle Fire Tablet is available in four different Models and you will find below the specs and features for the 4 models of Kindle Fire as available at Amazon’s digital store. The base model of Kindle Fire Tablet is often sold by Amazon at unbelievably low prices and you can knock off another $15 by going for Kindle Fire With Special Offers. This version of Kindle Fire Tablet offers the cheapest way to get first-hand experience of Amazon’s rich offering of Movies, Videos, Music and interact with Alexa (your digital assistant from Amazon). As you can see from above listing of specs, the base level of Kindle Fire tablet provides an outstanding value for money, considering its availability at such a low price. As you can see from the specs as listed below, Kindle Fire HD has better display, better audio and more memory compared to the base model of Kindle Fire. Kindle Fire HD 8 is the best sub $100 tablet that you can find in the market and this is the model of Kindle Fire that you should go for, in case you are looking to buy Kindle Fire. Kindle Fire HD 10 provides full HD display, Dolby Stereo Speakers, more memory and more native storage compared to Kindle Fire HD 8. As you can see from listing of specs below, the Quad Core Processor on Kindle Fire HD can turbo boost up to 1.8 GHZ, which is useful in case you are looking to play Games on your Kindle Fire Tablet. Kindle Fire Kids Edition tablet is specifically designed for Kids and comes with a Kid-Proof Case and two years warranty from Amazon. This Kindle Fire Tablet for Kids includes 1 year subscription to Amazon FreeTime Unlimited. This service for Kids provides access to Movies, TV Shows, Educational Apps, Games and over 15,000 books that are suitable for 3-12 year old kids. Kindle Fire Kids Edition Tablet features Kid Safe browser which blocks out access to Social Media and inappropriate content. Parents can manage and customize Kindle Kids Edition Tablet for up to 4 Kids using four individual child profiles. The “Learn First” feature in Kindle Fire Kids Edition allows parents to block access to Games and Videos, until educational targets are met. Kindle Fire Kids Edition Tablet is available in regular and HD versions. As mentioned above, both versions come with a Kid-Proof Case, 2 Years Warranty and 1 year access to Amazon FreeTime Unlimited. *Price may vary due to sales/offers. In case you haven’t yet come up with a decision, you can go through the Kindle Comparison tables as provided below. These comparison tables should help you compare the major specs and features of the 4 models of Kindle E-Readers as available in the market.